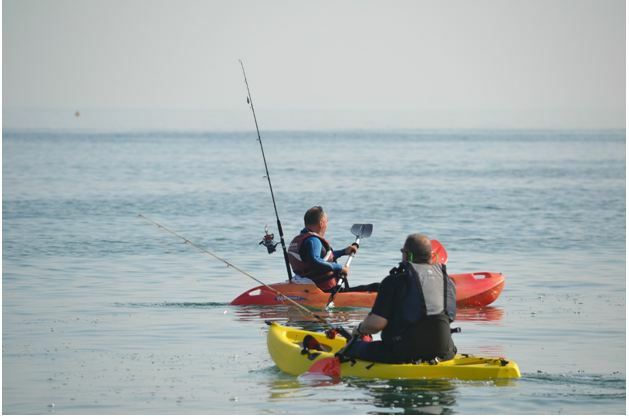 Kayak fishing is a great pastime but only if you are well prepared and well organized. Poor planning will make the expedition frustrating and uncomfortable. The more preparation you put in, the more time you can spend fishing and enjoying yourself. You will have more fun this way and you will probably catch more fish. Getting a good kayak is important but the preparation and accessories are just as important. While there are many items you can buy, the sport lends itself to the DIY approach. There are many easy and inexpensive modifications you can make to your kayak that will make the outing more pleasurable. Without adequate and logical storage you will not be able to find the things you need in a hurry and the kayak will be cluttered with loose items. These will roll around inside, get in the way and probably get damaged. The main items that require storage are the fishing rods and tackle. You will also need somewhere secure to keep clothing, tools, food, a first aid kit and other items you wish to take with you. There are a range of containers and storage option you can consider. One of the better options is a sturdy milk crate. These are inexpensive and perfectly suited for the job. Make sure it the right size for your needs and the kayak and that it is firmly secured. What makes the milk crate such a great options is the fact that they are not expensive, they are normally a convenient size, they are durable and the slatted design allows them to drain well, attach easily and accommodate other accessories such as rod holders. Protect the kayak by placing a layer of foam or rubber underneath and secure it on a flat suitable area. It is not just the big items that need to be secured. You will need somewhere to keep snacks, sunglasses, lip balm and sunscreen. The easiest way to do this is a small container or a few containers secured with hook-and-loop tape. Attach one side to the container and the other to a secure easy to reach area inside the kayak. You will need your hands free at times or you might want to have a few lines out at once. This is where a rod holder comes in handy. This is another simple and low-cost DIY project. While you can buy a rod holder, one can be made from an inexpensive PVC pipe cut to fit your rod. This can then be attached to the milk crate or the side of the kayak. Paddle guides or paddle holders can be made from a wire coat hanger in seconds. Simply twist the wires, bend into the required shape and attach through the existing holes on the side of the kayak. A kayak can become heavy and difficult to manage so it is a good idea to attach a basic handle to the front. A short length of rope that snaps on and off will also be useful in some circumstances. Check out a few great options here: https://dream-guides.com/kayak/best-brands. A DIY setup can be done with a pulley or trolley anchor system. The items needed should be available at any hardware store. Once assembled, it can be placed at the stern, middle or bow of the kayak. It allows you to stop easily when you want to and hoist the anchor up to continue when you are done. The anchor itself can even be a DIY effort. Just find a weight you can secure that is around 2 to 4 pounds. As you will not be paddling the entire time, it is useful to have somewhere to store the paddles out of the way when not in use. A simple system of cords and straps can be made. These can attach to the side of the kayak and the paddles can be stashed when not needed. This will allow you to relax and enjoy your fishing or a beverage without having to worry about the paddles. Make sure it is a safe and secure system as you do not want to be stranded without your paddles. It is not only in the front that you want a handle. Sometimes you and your partner might carry the kayak together. In this case, you will need side handles. A thin PVC pipe thread over a harness will take you seconds to put together and will make the job of carrying the kayak much more comfortable. With these fast, inexpensive and easy to do DIY tips, your kayak fishing expedition will be relaxing and pleasurable.